If you have a whole bunch of dyed eggs around, here are my fav uses for any hard boiled eggs! I eat them plain as a snack, or egg salad, but that may only take you so far. I’ve actually dyed un-boiled eggs when I wanted to play with the color but not have a dozen hard boiled eggs around. That was without a toddler! 1) Use hard boiled eggs for all the deviled eggs! They are such a hit at a party…often vegetarian (I made my bacon ones obvious by topping them with bacon so there weren’t surprises), often dairy-free, often gluten free…depending on the variety! They’re a small bite without silverware and don’t require reheating! Make just a few and serve them with dinner or lunch at home. You don’t even have to wait for a party! Are you surprised I have more variation ideas I just haven’t made yet?? 2) Use hard boiled eggs for the to-go option where you might have another egg! 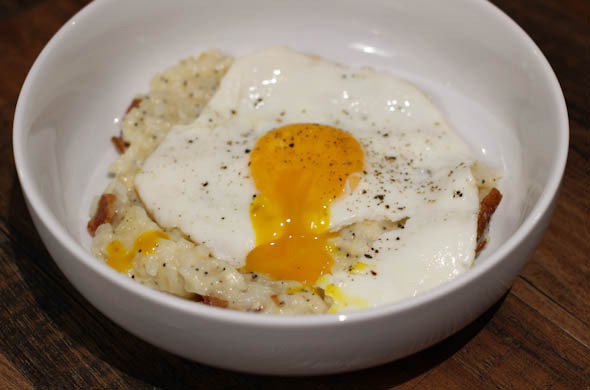 Breakfast Risotto I made had white cheddar, bacon, everything bagel seasoning and was served with an egg for the runny yolk. When I packed leftovers for work, I heated the risotto and chopped a cold hard boiled egg to go on top just before eating (with extra everything bagel seasoning). Avo & Egg Toast with Everything Bagel Seasoning would speed up immensely if the egg was a chopped hard boiled one! 3) Use hard boiled eggs to amp up the protein on a veggie side dish! 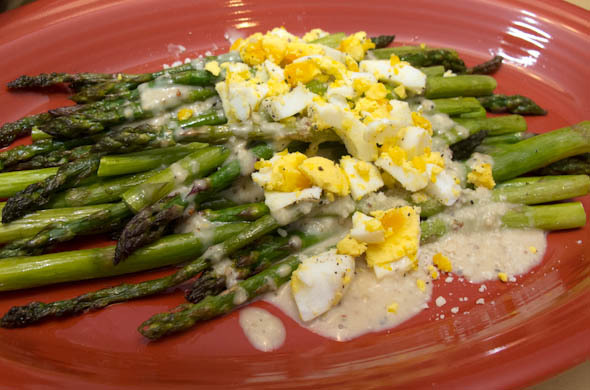 Caesar Asparagus was a springy feeling side that was just so easy: roasted asparagus, MYO caesar dressing, and top with some hard boiled eggs and plenty of salt & pepper! 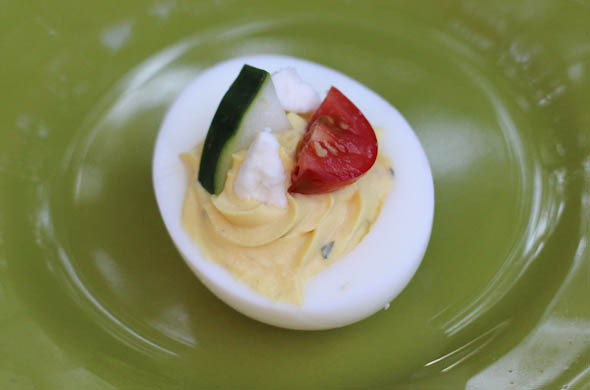 4) Use hard boiled eggs for Cobb Salad themed anything! I made a cobb salad inspired burger. I’ve made a Cobb Salad Dip! Make a cobb salad chicken sandwich! Make it a regular cobb salad! Make it a cobb salad crostini appetizer! 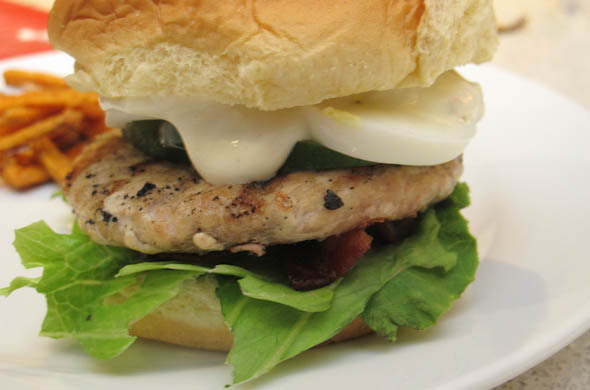 Bacon, chicken/turkey, eggs, lettuce/cucumbers/tomato, and blue cheese is always a welcome combo! 5) Use hard boiled eggs for topping on a breakfast pizza! 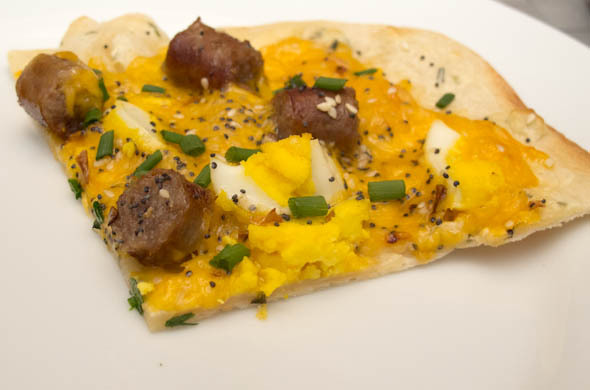 This breakfast pizza from back in the day had cream cheese with chives spread onto the crust then topped with shredded cheddar, breakfast sausage, hard boiled eggs, and everything bagel seasoning. This is the foolproof way to do eggs on breakfast pizza if you are cooking for a crowd and don’t want to test the baking time needed for an egg cracked onto a pizza!